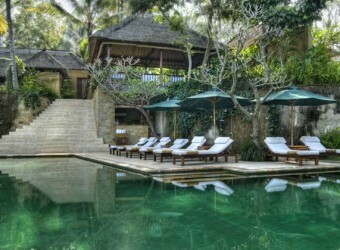 Bali Hotel Only four building luxury villas run by the owner of Neka Museum, Komaneka Tanggayuda. Voss and a beautiful view overlooking the river, to project the green landscape around the main pool is a great beauty. All villas private pool, Balinese pavilion courtyard "Bengon Bale" is located, including bus services and the flower canopy bed, private spaces are isolated and spread around.